Objective To compile and evaluate the evidence on the effects on health and social outcomes of computer based peer to peer communities and electronic self support groups, used by people to discuss health related issues remotely. Design and data sources Analysis of studies identified from Medline, Embase, CINAHL, PsycINFO, Evidence Based Medicine Reviews, Electronics and Communications Abstracts, Computer and Information Systems Abstracts, ERIC, LISA, ProQuest Digital Dissertations, Web of Science. Selection of studies We searched for before and after studies, interrupted time series, cohort studies, or studies with control groups; evaluating health or social outcomes of virtual peer to peer communities, either as stand alone interventions or in the context of more complex systems with peer to peer components. Main outcome measures Peer to peer interventions and co-interventions studied, general characteristics of studies, outcome measures used, and study results. Results 45 publications describing 38 distinct studies met our inclusion criteria: 20 randomised trials, three meta-analyses of n of 1 trials, three non-randomised controlled trials, one cohort study, and 11 before and after studies. Only six of these evaluated “pure” peer to peer communities, and one had a factorial design with a “peer to peer only” arm, whereas 31 studies evaluated complex interventions, which often included psychoeducational programmes or one to one communication with healthcare professionals, making it impossible to attribute intervention effects to the peer to peer community component. The outcomes measured most often were depression and social support measures; most studies did not show an effect. We found no evidence to support concerns over virtual communities harming people. Conclusions No robust evidence exists of consumer led peer to peer communities, partly because most peer to peer communities have been evaluated only in conjunction with more complex interventions or involvement with health professionals. Given the abundance of unmoderated peer to peer groups on the internet, research is required to evaluate under which conditions and for whom electronic support groups are effective and how effectiveness in delivering social support electronically can be maximised. One of the most promising aspects of the rise of ehealth is the widespread availability of electronic peer to peer community venues, where people with common interests gather “virtually” to share experiences, ask questions, or provide emotional support and self help. Virtual communities are social networks formed or facilitated through electronic media.1 Although such communities already existed in the era before the world wide web (for example, in bulletin board systems and private networks that enable peer to peer communities), the primary medium for virtual communities today is the internet, in mailing lists, newsgroups or usenet discussion forums, web based discussion forums, and live chatrooms. Virtual communities can be seen as mental health and social support interventions. They often have the function and character of self support groups and are then also called electronic support groups. As of April 2004 Yahoo!Groups (http://www.yahoo.com/) listed almost 25 000 electronic support groups in the health and wellness section. Although plenty of descriptive and anecdotal information exists on the potential benefits2 and harms of online peer support,3 we sought evidence—beyond case studies and qualitative work—for the efficacy of virtual communities as stand alone or adjunct interventions in health care and their impact on health related outcome measures. We sought randomised controlled trials, non-randomised controlled trials, and cohort studies to draw conclusions about effectiveness, as well as before and after studies and interrupted time series to draw conclusions about promising interventions. We retrieved observational and qualitative studies, cross sectional surveys, and content analyses of community interactions and used these to inform the background and discussion, but we did not systematically search for or abstract these studies. We included studies, in any language, published in peer reviewed journals or “grey” literature (dissertations, government reports, etc) that met the following criteria. Firstly, the intervention studied was a virtual community (or had a virtual community component), defined for the purpose of this study as a group of individuals with similar or common health related interests and predominantly non-professional backgrounds (patients, healthy consumers, or informal caregivers) who interact and communicate publicly through a computer communication network such as the internet, or through any other computer based tool (including non-text based systems such as voice bulletin board systems), allowing social networks to build over a distance. Secondly, the content focus of the virtual community was on health or healthcare issues in the broadest sense, including emotional and social support, health education, or health related behaviour change. Thirdly, the outcomes measured were knowledge, health, psychological or social outcomes, or use of health services. Fourthly, a control group (or a baseline measure) was present and outcome measures were reported. We excluded studies where the only community building components were videoconferencing or telephone interactions or where the intervention was giving people computers, communication tools, or internet or web access (for example, studies such as the HomeNet4 study), unless participants were at the same time enrolled in a specific health related online support group. Detailed search strategies are presented in appendix 1 on bmj.com. Briefly, we combined three search concepts “[self support and computer communication network] or e—communityvenue”, with various synonyms for each of these three concepts. To maximise recall we applied no methodological filters. To cover not only the medical but also the social sciences and electronics literature, we conducted extensive searches across disciplines in the following bibliographical databases: Medline (Ovid, 1966-October 2003), Embase (Ovid, 1980-week 40, 2003), CINAHL (Ovid, 1982-October 2003), PsycINFO (Ovid, 1972-September 2003), Evidence Based Medicine Reviews (Ovid, second quarter 2003), Electronics and Communications Abstracts (CSA, 1981-October 2003), Computer and Information Systems Abstracts (CSA, 1981-October 2003), Educational Resources Information Center (ERIC; CSA, 1966-October 2003), Library and Information Science Abstracts (LISA, 1969-September 2003), ProQuest Digital Dissertations (ProQuest, 1997-October 2003), Web of Science (ISI, 1980-December 2003). Two pairs of reviewers (GE-CR and JP-AS), with each reviewer working independently, each screened half of the abstracts to decide whether the full paper should be obtained. Disagreements were resolved by discussion. At least two reviewers then again screened full text articles, and a decision on including or excluding a study was made through discussion and consensus. At least one reviewer abstracted included studies into an electronic abstraction form (Microsoft Access), consisting of 72 questions pertaining to study characteristics and results. Team review and discussion of all abstracted studies ensured consistency in the abstraction of studies. From all databases combined we identified and screened a total of 12 288 abstracts (figure). We selected 76 publications for retrieval of full text versions. Forty five publications met our inclusion criteria, describing 38 distinct studies: 20 randomised controlled trials, three meta-analyses of n of 1 trials, three non-randomised controlled trials, one cohort study, and 11 before and after studies (for included studies see tables A-D, for excluded studies see appendix 2, for multiple publications of the same study see appendix 3, all on bmj.com). 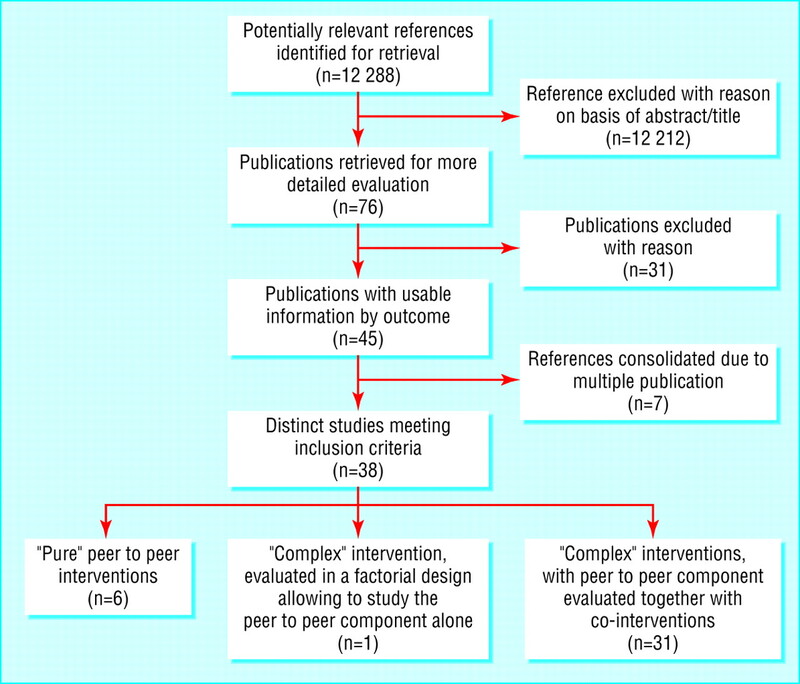 Only six of these studies dealt with “pure” peer to peer interventions.5–10 One study had a 2x2 factorial design (full or control website combined with or without peer to peer group), enabling the comparison of a peer to peer group with a minimal co-intervention with other arms.11 The remaining 31 studies evaluated complex interventions where the virtual community was only an adjunct to a broader intervention that often included structured psychoeducational components or treatment programmes, entailed giving printed brochures or videos, computers or web television access to participants, incorporated decision support or one to one therapeutic relationships with health professionals, offered personal online diaries, or contained games (table A on bmj.com). Examples of such complex interventions with peer to peer “adjunct” components are CHESS, Computerlink, Starbright World, Bosom Buddies, and Student Bodies. Because of the multiple components within these interventions it is not possible to draw more generalisable conclusions about the value of online peer to peer communication from them, as the results will be confounded by the co-interventions. The six studies evaluating “pure” virtual communities were before and after studies evaluating web based discussion forums,6 10 a chat room,8 or a combination of a chat room and newsgroup,9 with one cohort study evaluating mailing lists7 and one non-randomised controlled trial evaluating a voice bulletin board system.5 We identified no randomised trials evaluating the effects of peer to peer communities alone. We found one factorial design randomised controlled trial that compared the effects of the different components (including the peer to peer component) of a complex intervention with each other.11 The reporting of this trial is incomplete, however, as no P values for all comparisons are provided. Of the six studies, only one7 dealt with unmoderated venues; the remaining studies all reported some degree of facilitation by a health professional. With one exception, even studies coded as “stand alone” peer to peer interventions therefore had involvement from health professionals, with trained individuals leading the groups as moderators or facilitators by stimulating discussions, formulating questions, or posting topics of interest or educational material on the bulletin boards. Table B on bmj.com summarises the characteristics of the studies; tables C and D on bmj.com report quantitative and qualitative findings from them, respectively. Tables 1 and 2 summarise the outcome measures reported most often across all studies. Depression and social support (each used in 12 studies) were the most commonly used measures. Only three studies, among them a before and after study and a cohort study, found significant improvements in depression scores, and nine studies (among them eight randomised controlled trials) did not find or report an intervention effect on depression. Similarly conflicting are the data for social support measures; five studies found significant effects and seven studies did not. Six studies investigated the effect of smoking cessation programmes that included peer to peer groups. In a factorial design randomised controlled trial11 the effect of the two main components (psychoeducation programme on the website and peer to peer group) were evaluated separately. Abstinence rates after 1, 3, and 6 months in the arm with peer to peer group and minimal information intervention were slightly higher than in the arm with no peer to peer group and minimal information (6.8%, 5.5%, 9.3% v 3.6%, 2.9%, 7.6%, no P values reported). Abstinence rates were similar in the arm with peer to peer group and full psychoeducational intervention and the arm with no peer to peer group and full psychoeducational intervention (7.5%, 7.5%, 10% v 6.6%, 6.6%, 10.8%). Similar to many other studies in this field, this randomised controlled trial had methodological problems, with more than half of the participants not responding to follow up surveys and low usage of the intervention (less than 10% used the intervention). Although we did not formally score quality, we coded certain aspects of study quality. Among the 20 randomised controlled trials, only three trials described their randomisation methods in sufficient detail to permit the ascertainment of allocation concealment. One randomised controlled trial had used a clearly inappropriate randomisation method, using the last digit of the Compuserve ID to determine the intervention.11 All studies were necessarily unblinded and most outcomes self reported. Intention to treat analysis had been conducted for only eight randomised controlled trials. Despite extensive searches in the health, social sciences, communication, and informatics literature we failed to find robust evidence on the health benefits of virtual communities and peer to peer online support. In 31 studies investigators evaluated complex interventions, combining, for example, educational or cognitive behaviour therapy components with peer to peer communities, making it impossible to draw conclusions on the effectiveness of “pure” electronic peer to peer interactions as used daily by millions of people participating in internet discussion groups or mailing lists. The six studies that investigated peer to peer communication as stand alone interventions tended to have less than optimum research designs with few participants. Half of the studies that evaluated “pure” peer to peer interventions were before and after studies. As many participants improve “naturally” over time (regression to the mean), these studies are insufficient to attribute improvements of psychological or health outcomes to the intervention. In those cases where authors found statistically significant effects, no information was given as to whether the (often minimal) group differences were clinically significant. Most studies were exploratory in nature and many investigators administered multiple instruments and made multiple comparisons, diminishing the worth of a “positive” finding (for example, in a study with 20 comparisons one would expect one comparison being “significant” on a 5% level by chance alone). The absence of evidence does not mean that virtual communities have no effect. Several explanations are possible for the lack of studies and evidence. Firstly, there is little commercial or professional interest in evaluating “pure” virtual communities and “unsophisticated” peer to peer interventions such as mailing lists, as opposed to more complex interventions or interventions led by health professionals. Secondly, studies investigating “natural” self helping processes are difficult to recreate in controlled research environments. Many studies seemed underpowered, and only five provided sample size calculations or justifications. Another possible explanation for the failure of many authors to show an effect of virtual communities is that participants may need to have the intrinsic desire to communicate with other people in order for virtual communities to be beneficial. Participants in self help groups may be a self selected subgroup in whom self help processes are effective, and researchers “recruiting from the street” may be looking at the wrong populations. A third possible (but related) reason could be lack of participants' “compliance.” Some investigators reported that the virtual community component was not heavily used,6 15–17 making it difficult to show an effect. It was, however, encouraging that some interventions did show an effect, and that in only two instances the control was favourable over the virtual community in terms of a health outcome13 or resource use.12 In some studies7 18–20 an association between greater use of peer to peer groups and better outcomes was observed, indicating a dose-response association, but the direction of causation (whether increased use leads to better outcomes, or whether an improvement in outcomes such as depression due to other factors leads to increased use) is unclear. In view of the wide variation in interventions, measurement tools, and populations studied, and the lack of methodological rigour in the majority of studies reviewed, the effect of online support groups on health related outcomes and healthcare resource use remains unclear. Only one database (LISA) has a subject heading for virtual communities; we may therefore have missed more complex ehealth systems or interventions that have peer to peer components if these were not evident from the abstract or title. However, we are unlikely to have overlooked studies evaluating “pure” electronic peer to peer interventions, and the paucity of such studies is striking. Another concern is publication bias, which we attempted to minimise by including five dissertations. Their inclusion in this systematic review proved to be crucial. Interestingly, the four dissertations with “negative” (non-significant) findings remained unpublished whereas the one dissertation with positive results was published as a journal article; this implies that more (mostly negative) work may have been conducted but remained unpublished. Virtual communities are promising interventions, used everyday by millions on the internet. Many questions remain and should be the focus of future research. Little is known about the conditions and factors (of the group or individual) influencing outcomes. Whether virtual communities benefit from professional (or laypersons’) moderation or facilitation is not clear either. With the exception of two studies, all investigators used professionally moderated or facilitated groups, or the level of moderation remained unclear. It is not clear whether virtual communities can substitute or complement face to face support groups. One study compared a computer mediated (voicemail) support group with a face to face group, noting that participation rates were significantly higher in the virtual group,5 but another study showed that virtual groups may be less effective than face to face groups to sustain weight loss.14 In terms of the outcome measures used, future studies should also include measures of resource use, as it is currently not clear whether participation in a peer to peer group reduces or increases the use of health care. Although qualitative studies—if conducted ethically—are needed and give fascinating insights into people's self helping processes in virtual communities,29 quantitative research is required to evaluate under which conditions and for whom electronic support groups are effective and how effectiveness in delivering social support can be maximised. Factorial design randomised controlled trials can help to evaluate which components of a complex intervention are contributing to an effect, but many problems remain, as by their nature they are not well defined, reproducible interventions, participants tend to be self selected, and participants for which the groups do not work are often lost to follow up. Given the abundance of unmoderated peer to peer groups on the internet, researchers must focus their efforts not only on sophisticated professionally led systems, but shift their attention to consumer led, self help venues. Perhaps in this way the research community can best help consumers to help themselves, a guiding principle of support groups regardless of the venue in which they occur. Note about process While GE has the same departmental affiliation and works (with AS and CR) in the same centre as Alejandro Jadad, guest editor of this theme issue, it was submitted to the BMJ in the normal way, and Jadad neither played any part in the decision making over this paper, nor was he involved in conception or conduct of this study.
. An electronic group is virtually a social network. In Kiesler S, ed. Cultures of the internet. Mahwah, NJ: Lawrence Erlbaum, 1997: 170–205.
. Alone together. Cancer patients and survivors find treatment—and support—online. It can make all the difference. Oncologist 1999; 4: 59–63.
. Enter at own risk. Noticeboard 2003; 11.
. Internet paradox: a social technology that reduces social involvement and psychological well-being? Am Psychologist 1998; 53: 1017–31.
. Electronic self-help and support groups. Med Care 1996; 34: OS32-OS44.
. Effect of a nurse-managed support group via an internet bulletin board on the perception of social support among adolescents with insulin-dependent diabetes mellitus [dissertation]. Texas Tech University, 2000: 1–102.
. Internet support groups for depression: a 1-year prospective cohort study. Am J Psychiatry 2002; 159: 2062–8.
. The chatline as a communication and educational tool in adolescents with insulin-dependent diabetes: preliminary observations. Diabetes Care 2000; 23: 1853.
. Electronic support groups for breast carcinoma. Cancer 2003; 97: 920–5.
. The role of support groups on the Internet for those suffering from chronic kidney disease [dissertation]. University of the Pacific, 1999: 1–128.
. Computerized Communication as a medium for behavioral smoking cessation treatment: controlled evaluation. Comp Hum Behav 1990; 6: 141–51.
. Impact of a patient-centered, computer-based health information/support system. Am J Prev Med 1999; 16: 1–9.
. Does using the internet facilitate the maintenance of weight loss? Int J Obes Relat Metab Disord 2002; 26: 1254–60.
. Meta-analysis of randomized educational and behavioral interventions in type 2 diabetes. Diabetes Educ. 2003; 29: 488–501.
. The effect of web-based support as an adjunct to a self-help smoking cessation program [dissertation]. University of North Texas, 2002: 1–121.
. The diabetes network internet-based physical activity intervention: a randomized pilot study. Diabetes Care 2001; 24: 1328–34.
. Evaluation of a computer-mediated eating disorder intervention program. Int J Eat Disord 1998; 24: 339–49.
. Computer-mediated social support: single young mothers as a model system. Am J Community Psychol 1998; 26: 281–306.
. The buffering effect of a computer support network on caregiver strain. J Aging Health 1998; 10: 20–43.
. Computer network home care demonstration: a randomized trial in persons living with AIDS. Comput Biol Med 1998; 28: 489–508.
. The quality of online social relationships. Communications of the ACM 2002; 45: 103–8.
. Medical information on the Internet: a study of an electronic bulletin board. J Gen Intern Med 1997; 12: 466–70.
. Reader beware: diabetes advice on the web. Pract Diabetes Int 2002; 19: 108–10.
. What questions do patients ask in a cardiology newsgroup and how reliable are the answers? Br J Cardiol 2001; 8: 165–8.
. Verbal aggression and self-disclosure on computer bulletin boards [report]. Hawaii, 1991: 1–19.
. Contexts of uninhibited online behavior: flaming in social newsgroups on Usenet. J Am Soc Informat Sci 1998; 49: 1135–41.
. Frauds, hoaxes, myths, and chain letters: or, what's this doing in my e-mail box? Searcher 1998; 6: 50–5.
. Discussions about suicide in internet delivered cancer support groups. Psychooncology. 2003; 12: S96.
. Ethical issues in qualitative research on internet communities. BMJ 2001; 323: 1103–5.
. From patients to end users. BMJ 2002; 324: 555–6.
. The impact of the internet on cancer outcomes. CA Cancer J Clin 2003; 53: 356–71.